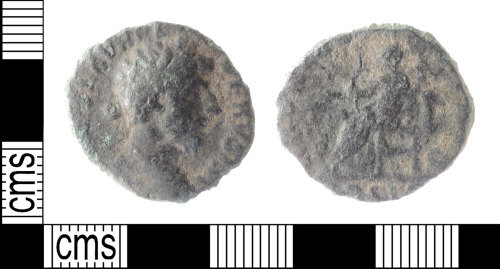 A copper alloy Roman as of Lucius Verus, dating to the period AD 161-163 (Reece Period 8). FORT RED TR POT [...] // COS II reverse type depicting Fortuna seated left, holding rudder and cornucopiae. Mint of Rome. cf. RIC III 1354; cf BMC 1067ff. Originally included as part of a scattered hoard (2011 T154), but now considered to be a separate loss. Obverse description: Laureate, cuirassed bust right. Reverse description: Fortuna seated left, holding rudder and cornucopiae.